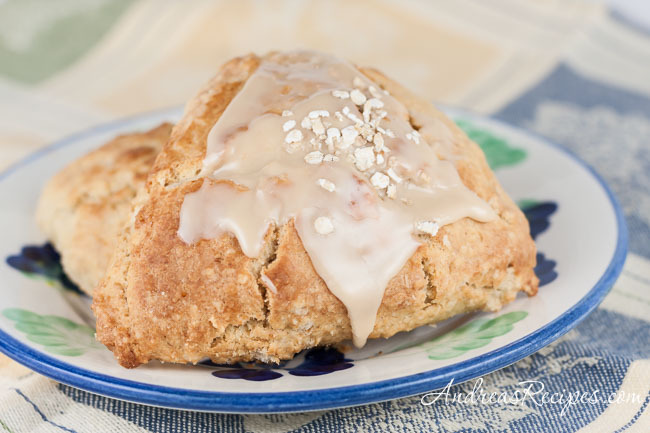 Ina Garten’s recipes doesn’t skimp on flavor, and these tasty scones are no exception. With a full pound of butter and about a million calories in each one (ok, maybe not a million…) these probably shouldn’t be in the regular breakfast repertoire, but they make a wonderful treat for a weekend brunch party. It’s an easy make-ahead recipe, too. You can make the dough a few days ahead of time and keep it in the refrigerator until you are ready to bake. The full recipe makes 16 to 18 scones, so cut it in half if you want a smaller batch. Although the recipe says that you can use a stand mixer, I’ve found that mixing by hand works better for me. My KitchenAid stand mixer is an older model with the 4-1/2 quart bowl, and it seemed a bit stressed by all the butter and flour. 2. In the mixing bowl, stir to combine the all-purpose flour, whole wheat flour, oats, baking powder, sugar, and salt. Add the cold butter and mix at the lowest speed and mix until the butter is in pea-sized pieces. 3. Stir together the buttermilk, maple syrup, and eggs. Pour into the the flour-and-butter mixture and stir with a heavy wooden spoon just until blended. The dough may be sticky, but if it’s too sticky you can dust on a little additional flour. 4. Dust the work surface with plenty of flour and dump 1/3 of the dough. Flour your hands and gently work the dough to make sure the ingredients are thoroughly combined. Pat the dough into a circle 3/4- to 1-inch thick. You should see lumps of butter in the dough. Cut the dough into 6 triangles and place them on the baking sheet. 5. Brush the tops with egg wash. Bake for 20 to 25 minutes, until the tops are crisp and the insides are done. Remove from the pan and cool on a wire rack. 6. GLAZE: Stir together the confectioners’ sugar, maple syrup, and vanilla. When the scones are done, cool for 5 minutes, and drizzle 1 tablespoon of glaze over each scone and quickly garnish with a few sprinkles of quick oats. The glaze sets quickly, so sprinkle on the oats immediately if you want it to stick to the glaze. Add 3/4 cup of raisins (75 g) or small-diced pecans (85 g). Plain yogurt works as a substitute for the buttermilk. Thanks for the buttermilk tip- have you done the milk + vinegar thing before? Since it’s just my husband and I, I feel so wasteful for tossing out buttermilk because I can’t bake that much. I do the milk + vinegar thing all the time. Like you, I don’t keep buttermilk on hand because I don’t use it fast enough. Make sure you let the milk and vinegar mixture sit for a few minutes before using it so the milk has time to sour a bit.